For five years after the Civil War, martial law and civil authority existed concurrently in Mississippi. That phenomenon created a constitutional entanglement that scholars have yet to unravel. Gov. Benjamin Grubb Humphreys had the misfortune of being caught in that knot of conflicting and often competing authority. When Humphreys was inaugurated on 16 October 1865, he shared power with a provisional governor, and he was eventually removed by a military governor whose authority Humphreys challenged and whose orders he countermanded. 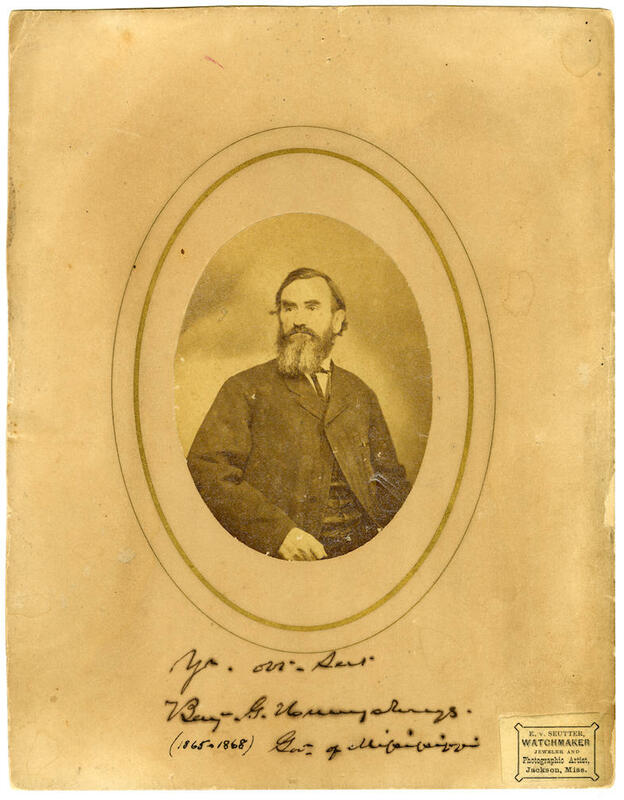 Humphreys was born on 26 August 1808 at Hermitage, his father’s plantation in Claiborne County along the Bayou Pierre. He was appointed to the US Military Academy at West Point but was expelled with about forty other cadets after they were involved in a Christmas frolic. He then returned to Mississippi to help his father manage the plantation. For almost a decade, Humphreys, a Whig, represented Claiborne County in the state legislature, serving in both the House and the Senate. In 1846 Humphreys purchased some land in Sunflower County and established a plantation at Roebuck Lake. Humphreys opposed secession, but when the war began, he organized the Sunflower Guards and was soon elected colonel of the 21st Mississippi Regiment. Union troops destroyed his plantation during the Vicksburg Campaign. In July 1863 Humphreys received a promotion to brigadier general and command of Gen. William Barksdale’s brigade after Barksdale fell at Gettysburg. Humphreys was seriously wounded at Berryville in September 1864 and was reassigned to duty in South Mississippi. On 2 October 1865 Humphreys was elected as Mississippi’s governor. Among the uncertainties during this difficult and confusing time was the possibility that a Confederate brigadier general might not be eligible for high office in postwar Mississippi. More broadly, Mississippi and other southern states were expected to reconstruct themselves and extend the rights of citizenship to their former slaves. White Mississippians, however, would not voluntarily do so. Humphreys criticized state legislators’ efforts to return African Americans to peonage and to deny them access to the courts and other Black Codes. But when Mississippi and other ex-Confederate states failed to reconstruct themselves under Pres. Andrew Johnson’s lenient plan, Congress placed the southern states under military law and installed military governors. While that action did not automatically remove the civil governor, it did create a rivalry between the military and civil authorities that led to Gov. Humphreys’s removal from office in 1868. Humphreys subsequently retired from public life and engaged in business and planting until his death on 22 December 1882. Humphreys County is named in his honor.